JOSHUA TREE - A medicinal marijuana user has filed a $25 million claim against the county, for false arrest and malicious prosecution for illegal cultivation after a case against him was dismissed based on lack of evidence. Joshua Tree Superior Court Judge Bert L. Swift dismissed the criminal case against Jeffrey Craig Canada, 48, arguing that prosecutors failed to prove the 20 plants found in Canada's apartment produced more marijuana than his daily prescribned dosage of five grams. On May 11, Swift ordered the return of the Morongo Valley resident's drug paraphernalia. But when Canada tried to retrieve his property Monday, he was told by Deputy Donald Dougan, one of several deputies who searched his home and arrested him, that evidence taken in a search warrant didn't have to be returned, and that there was a court hearing scheduled for May 26. "I guess the police are going to challenge (the claim)," Canada said. Sheriff's Sgt. Jay Blankenship would not comment on the case. "We're on a fact-finding mission right now," Blankenship said. "If (Canada) did file a claim, we'll investigate." Canada also contends Dougan encouraged his landlady to try to evict him. "I told (his landlady) the legal way to swerve him with an eviction notice and the steps to takd to ensure he will stay gone," Dougan wrote in his report. Deputies were informed at the time of Canada's arrest on Nov. 25 that he had a doctor's prescription for the 20 marijuana plants found inside his Hess Boulevard apartment. 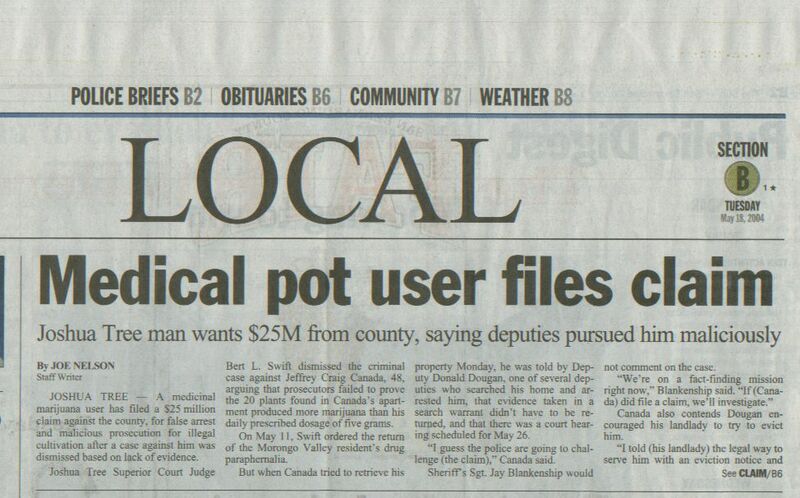 "Even though the sheriff's deputies knew at the time of the seizuer that this property was medicinal marijuana and the rights to use it are protected ... the sheriff's officers made no attempt to verify whether (Canada) was a bona fide medical marijuana patient," the claim states. After having adverse reactions to Prozac and other antidepressnats, Canada found a doctor in El Cajon with a reputation for prescribing marijuana to patients, and visited an array of cannabis clubs in San Francisco to find the kind of pot that suited him. "It took me years to go to clubs, selecting seeds from strains (of marijuana) that give me a clear head and enabled me to function," Canada said. "These people complain about disabled people costing them money, and here I am growing my own medicine, and here they are stealing it on Thanksgiving. Contact writer Joe Nelson at (909) 335-2540 or via e-mail at Joe.nelson@sbsun.com.